Since we have been hosting Mac minis for over a decade, we have quite the mix of machines here. We even have some here from our very first month in business. Eleven years and still serving for those little guys. Since we buy so many Mac mini parts, I’ve noticed some real trends over the years. When it comes to upgrading Mac minis, I think we’re in a pretty nice sweet spot right now. I think that most people don’t know the current opportunity so I thought I’d do some digging and get some of that data out. Over the last year, the price of RAM has gone down quite a bit. If you have a unibody Mac mini with less than 8GB of RAM, this upgrade is a no-brainer. It takes 30 seconds to upgrade and will really make a difference. 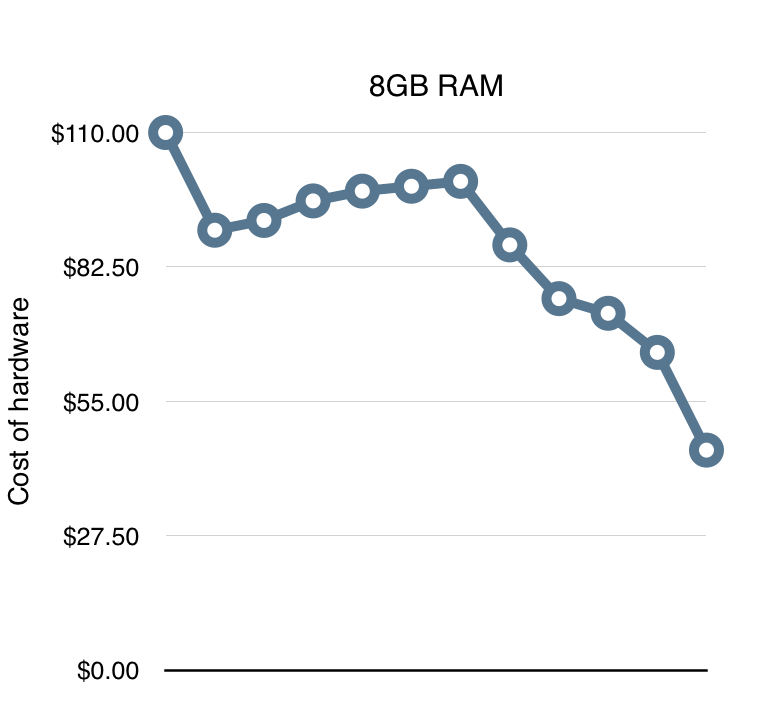 Check out the pricing of RAM in just the last 12 months. The 16GB RAM upgrades are similar, down nearly 50%. 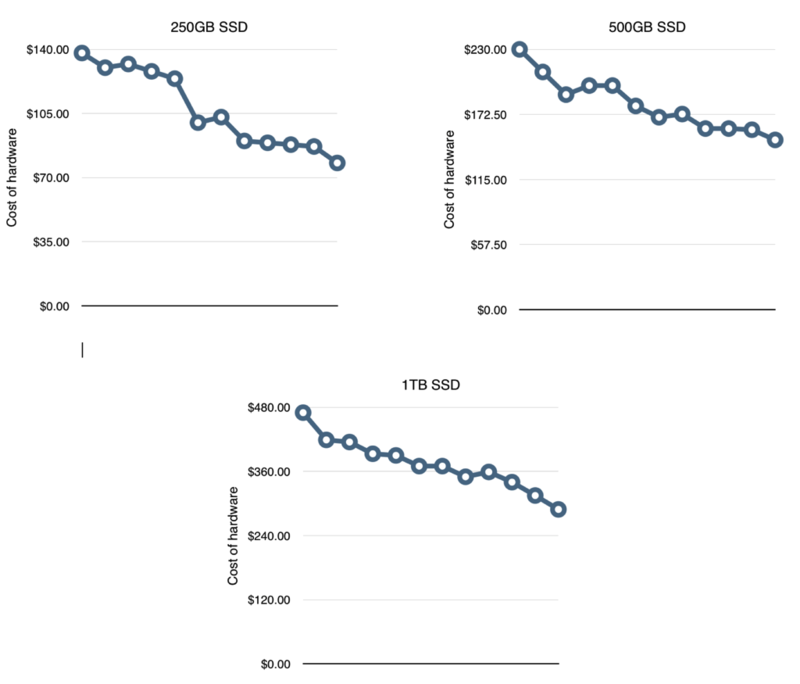 The price on SSD drives have also become quite affordable. Dollar for dollar, it’s not on par with the spinning disk option, but definitely in the price range for the average consumer. We agree with Wirecutter that the Samsung 850 EVO is the best SSD available for the Mac mini. It's been out for a while and has proven very reliable when installed. The process is a bit more difficult than RAM, but not as hard as you think. Here is the pricing for the 850 EVO in the last year. The amazing thing about these upgrades is that really makes a big difference in the machine. The 2012 Mac mini shares many of the same components as the 2012 non-Retina MacBook Pro which Apple still sells. Once upgraded, the performance is competitive or better than some of today’s machines. This is why used Mac minis are always so popular. So why a sweet spot? For RAM, DDR3 has been the standard for some time. The factories are getting really good at turning out modules at a high rate so supply is plentiful. When Skylake is released, it will heavily call for DDR3L and DDR4 RAM so factories will shift toward that. Also, as seen on many current Macs, removable modules are becoming a thing of the past as well. The standard will become soldered and removable modules won’t need to be made anymore. Considering these future changes, RAM takes a funny pricing cycle. It is expensive when it’s first released, then the price bottoms out, then it starts to raise again as factories focus on newer RAM. I see this often as we hunt down RAM for older Mac minis here in the data center. I think we’re nearing the low-cost point for 2011 and 2012 Mac minis. If it’s been a while since you looked at upgrading and old Mac mini here or in your home/office, then it’s a good time to look again. The performance boost will be very noticeable and it won’t cost as much as you think. If you’re a Macminicolo customer, we’re available to help with any upgrades of course. If you have any other question, just contact us.